LOCATED IN THE coastal area of Mount Pleasant, South Carolina, 285 Plaza Court will leave you speechless. Built in 2002, this breathtaking penthouse lists at $4,289,000 and provides a 270-degree view of the Charleston Harbor, the Cooper River (pronounced Cup-pa in Lowcountry drawl, if you want to fit in right away) and the new Ravenel Bridge. 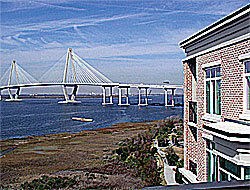 "It is a penthouse unit in the most ideal location on Charleston Harbor to capture these views," says Charles Swanson, a realtor with William Means Real Estate. "Without a doubt, this is a one-of-a-kind." The semiprivate elevator opens into an incredible entry. A private porch comes with the oversized master suite, which also features a custom walk-in closet, a sitting area and a luxurious bath with a spa tub and separate glass shower. The formal living room has a wraparound balcony and custom Canadian maple cabinetry, and you can also access a balcony through the family room and two guest bedrooms. An office area provides some much-needed privacy. The kitchen glows with modern stainless steel appliances and features black galaxy granite counters and a center island. It also has a floating ceiling with top-of-the-line Lutron lighting and a "smart house" wiring system. According to Swanson, the penthouse is ideal for anyone looking for the "perfect coastal lifestyle near the charms of Charleston and all it has to offer." The residence is located in Renaissance on Charleston Harbor, which offers "a wonderful pool, fitness area and spa, guest rooms for overflow from your unit and a beautiful club room for entertaining."